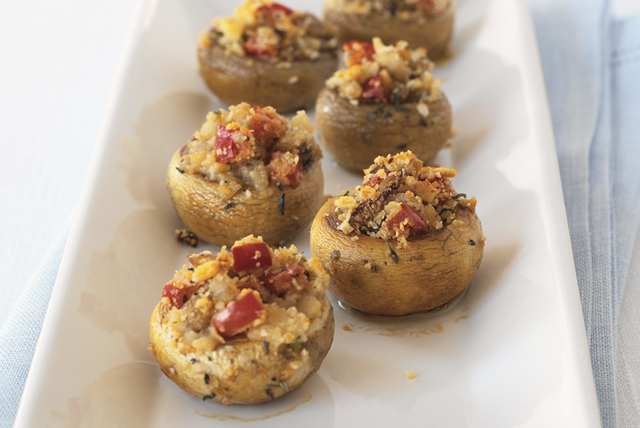 With their rich, buttery flavour and crispy topping, these mushrooms make the ultimate appetizer. Remove stems from mushrooms. Finely chop enough stems to measure 1/4 cup. Discard remaining stems or refrigerate for another use. Melt butter in small skillet on medium heat. Add chopped stems, onions and peppers; cook and stir 5 min. or until tender. Stir in cracker crumbs, cheese and seasoning; spoon into mushroom caps. Place on baking sheet. Mushrooms can be stuffed in advance. Refrigerate several hours or until ready to serve. Bake (uncovered) in 400°F oven 20 min. or until heated through.